Card, Orson Scott. 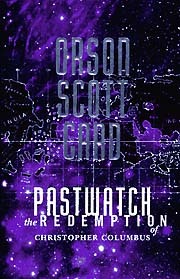 Pastwatch: The Redemption of Christopher Columbus . Tor 1996. Published: Tor 1996 (0312850581BUY), 1997 (0812508645BUY); SFBC 1996. Translation: French as La rédemption de Christophe Colomb , L'Atalante 1998 (2841720934). Translation: Spanish by Rafael Marín Trechera as Observadores del pasado: la redención Cristobal Colón , Ediciones B 1998 (8440681194).